Orifice Flanged Meter Runs are designed for use on many different process applications and conditions. These devices are carefully designed and manufactured to achieve optimum flow metering uncertainty, ensuring that installation of the orifice plate, adjacent pipework and tappings are compliant with ISO 5167 and AGA 3.
for square edge orifice plates for use in Fiscal and Allocation metering, if required. 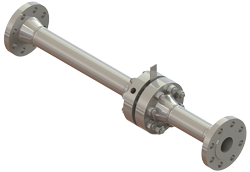 Solartron ISA offer Orifice Flanged Meter Run designs to suit many different pipework configurations, lengths, orientations and end connection requirements for any flow measurement application, using proven flow metering technology to all industry standards.